Happy September!! Can you believe that Summer has come to an end and the children are returning to school? 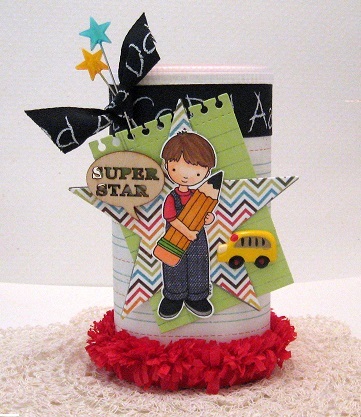 Today, I would like to introduce you to this sweet little digi from Whimsy and Stars Studio titled "Back to School". A quick little project using an empty Crystal Light container. It's amazing how quickly this all came together! Keeping all my seams in the back, I wrapped a school themed paper around the container, a piece of paper garland at the bottom and, school themed ribbon at the top. Then I went to work with my dies - notebook and star. I then added my digi that I hand colored with Copics and paper pieced overalls. The final touches; wood veneer speech bubble, acrylic school bus and two star pins. I filled my container with Candy Kisses, but you could fill it with crayons, erasers, or just about anything! A cute back-to-school gift! Adorable card Cathy! Hope you have a great weekend! What a super cute project - and how clever it is! Love when people share ways to 're-use' containers to make something extra special! Speaking of special: THANK YOU for your comment on my blog! Warm words go such a distance in keeping me encouraged and motivated! Happy Sept. 1 to you! !